dpQuery is a tool, which includes libraries and a template that adds a powerful interactive resource (Query wizard) for importing of practically any external data into your program. 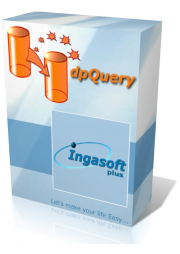 Having spent only a couple of minutes on adding dpQuery to the application, the programmer provides the end users with an easy to use tool with an intuitive interface, which allows loading data (including Binary) from any source, whether it be xbase files, MS Excel books, MS SQL tables, CSV, XML, Firebird/InterBase, DSN source, MS Access … you name it. The user is given a possibility to build simple and complex (relational) queries, to filter and sort the data, as well as edit and run an edited query right away. It allows any user familiar with the SQL SELECT statement to build his own queries of any complexity, which can be saved and invoked at any time. You can easy customize Query Wizard appearance. 2. You cannot load saved previous query (dpq file). 3. The field for editing query is limited to 128 characters. 4. The returned by query strings is limited to 255 characters. 5. Maximum query columns number are 255. 6. Maximum loaded records are 32767.